Proving once again that dachshunds are taking over the world, here's the latest wiener dog news from all over the globe! Woof! 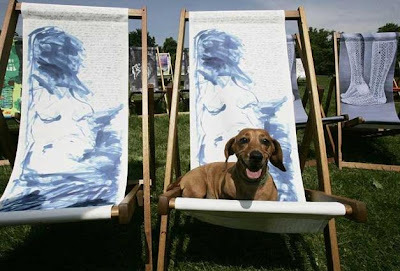 Above, sun-drenched red smooth 'Charlie' was one of the first to enjoy an exhibition of deckchairs unveiled in London's Hyde Park yesterday, each one dreamed up by artists and celebrities including Tracey Emin and Joanna Lumley. The colourful designs, launched by the Royal Parks Foundation under the name Deckchair Dreams 2008, are part of a collection of 700 chairs produced to raise money for the capital's eight Royal Parks. Read all about the exhibition at The Independent. Red smooth 'Shane,' from Fresno, California, is still a bit shaky at the emergency vets after eating snail bait in the garden, but he should be fine. Vets are sounding the alarm to watch out for snail bait, after 7 dogs were treated for poisoning on Tuesday night at just one practice. One dog who was brought in comatose did not make it. We hope you're feeling great today Shane. Read all about snail bait toxicity, watch a video, and find out which brands are safer for pets at ABC30. 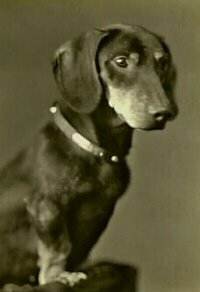 In an article explaining why dachshunds are the perfect dog (didn't we already know this? 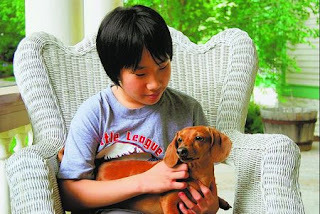 ), red smooth 'Ginger' sits with one of her humans, Ben Chung, of Cincinnati, Ohio. "She's long, short, small and easy to pick up," said Ben, who likes to play fetch with Ginger. Ben admits Ginger is somewhat territorial and can be slightly bossy. He and his sister don't seem to mind, though. "She's sweet," said Rachel. "She (also) thinks she's a cat." Ginger has a feline tendency to lie in the sun, Rachel said. Read all about Ginger at The Community Press. 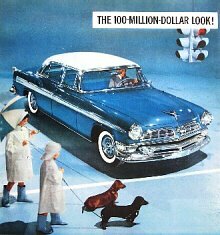 Talk about traveling in style.....there are now more dogs in Japan than children, and auto makers are taking note. Above, The Honda W.O.W. concept car changes the glove box into a dog box for pets on the move. Honda has a site called HondaDog, Toyota has a rival site, and even American independents are joining the cause with Dog Cars. Read all about it at Reuters. Have a great Friday, and happy travels! Twenty-five miles? We're exhausted just thinking about it! 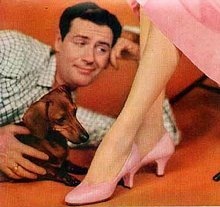 Meet red smooth 'Tiger Lilly,' and her human, UK TV presenter Linda Barker (huh?). They are about to embark on a 24.5 mile trek across Yorkshire's Three Peaks in aid of charity. The walk will raise money for Sue Ryder Care, a charity which provides specialist neurological and palliative care for people living with serious illnesses including multiple sclerosis, stroke, and motor neurone disease. Excerpt from The Halifax Courier: Linda said: "We are all really looking forward to the challenge, especially Tiger Lilly. As a dachshund she has a lovely lively nature and even though her legs are little, and she will have to take 20 paces to every one of mine, we believe she will be the first of her breed to complete the three peaks." Go Tiger Lilly! Read all about the event at The Halifax Courier. We're reminded of the pretty smooth brindled dachshund 'Paige,' who walked 250 miles across Wisconsin last year to raise both awareness and money for Huntington's disease. 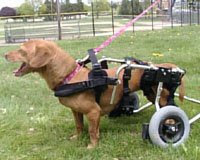 Read all about Paige's journey: Dachshunds Walking Across Wisconsin in the News. Who Let the Dachshunds Out? Thiry-five Wiener Dogs raced in the 2008 K-Bull 93 Johnson & Johnson Wiener Dog Race at the Energy Solutions Arena in Salt Lake City, Utah, last Thursday. This is a fun promo video for Utah's K-Bull country radio station of the event, complete with a special cheesy dachshund song! It's our birthday. Nothing to write home about. In one sense, it seems like just yesterday that we wrote our first introductory post, but in another, it seems like an eternity. 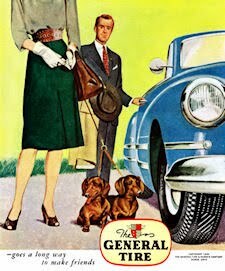 And we hope we've been faithful to our cause: dachshund love. 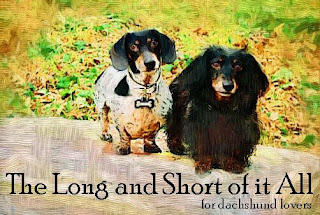 When we started The Long and Short of it All a year ago, we were unsure about where it was headed, but we felt there was certainly a need for dachshund news on the internet. 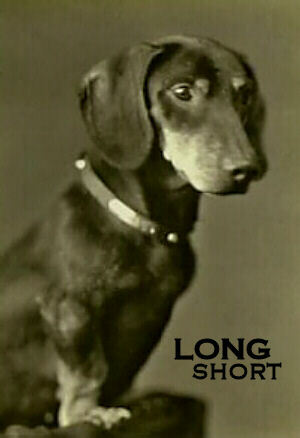 We hoped to sprinkle in dachshund stories, videos, art, famous dachshunds, photos, history, and trivia. 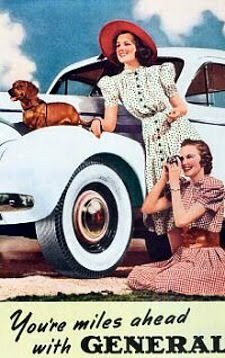 These things define 'Popular Culture' for us; the daily interactions, needs, desires, and cultural moments that make up the lives of dachshunds and dachshund lovers everywhere, every day. And boy, some days were tough. We get up in the morning thinking "What on earth will we post today? There's no news. No videos except a red smooth sleeping in the sun. Is that good enough? Will a flickr member get upset if we post one of their nice photos for art's sake? Is this video of a preacher talking and praying about the loss of his dog going to offend someone? Is this photo too risque?" This is post number 464, so we guess we've worked things out. We've seen hope, we've seen despair. We certainly hope that every post - no matter how trivial or fantastic - has had some quality and value though, and nothing is ever "just posted" so we can get on with our day. Thanks so much to our faithful readers, and folks who have submitted news, photos, stories and posted comments. We've made a lot of new friends along the way. This is what keeps The Long and Short of it All going. 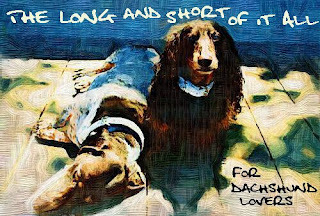 We had thought about retiring after one year, where the site would be just a daily look over a finite time of how important our dachshund animal companions are to us.....a brief moment in time, sort of like a painting or a novel. But we've decided to keep going on for now. So thanks so much for sticking with us. Woof! 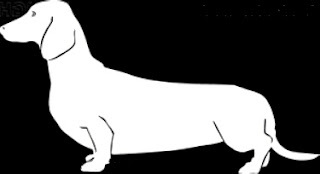 Some hope, and some despair: here's the latest wiener dog news from all over the country. These dachshunds are some of the 54, yes, fifty-four dachshunds that were rescued in a puppy-mill raid in Rockport Texas. Now shelters and rescue organizations all over Texas have the difficult task of finding homes for them. Many of the dogs, including those pictured above, have gone to Central Texas Dachshund Rescue. Excerpt from KEYETV: With only 30 foster parents and a tight budget, the recent rescue is putting some strain on the rescue organization's resources. “It was a lady who had 54 dogs in a mobile home with no air conditioning and you know dirty facility, dogs in cages.” Margie McKinley said, a foster mom with the Central Texas Dachshund Rescue. She’s caring for four of the dogs. One of the dogs is pregnant with five puppies and they’re due before morning, but McKinley specializes in dachshund labor and delivery. Read more at KEYETV. 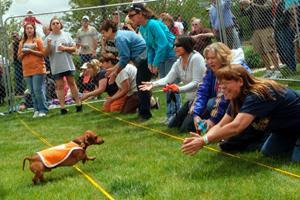 There were 78 dachshunds in attendance for the 6th Annual Wiener Dog Races in conjunction with the Annual Riverfest in Farmington, New Mexico on Saturday. Congrats to Chocolate 'Yoda' for emerging as the champion after 8 heats! As a winning prize, Yoda won a free night's stay at the Farmington Courtyard Marriott, although hotel management said the prize was for the dog's owners only and that Yoda was not welcome. What the heck? Read all about the fun event and see more photos at The Daily Times. When a group of students in Oklahoma heard that red smooth 'Johanna,' of Calais, Maine, needed a new set of wheels, they raised enough money to buy her a brand new cart! This is the same group of students who bought Johanna her original cart three years ago. 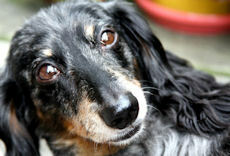 Read all about the well-deserving dachshund, and see a nice video at WCSH6. 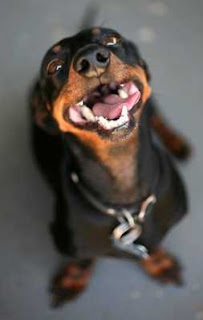 Finally, black and tan smooth 'Snoopy,' of Fresno, California, shows off his pearly whites during a smile session in an article about the human-like characteristics our pets have at The Fresno Bee. 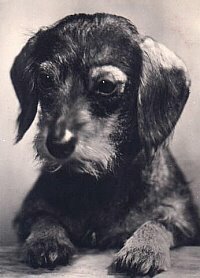 In honor of Memorial Day, enjoy reading about the spectacular life of 'Gus,' a black and tan dachshund who was rated a 'Senior Pilot With Combat Missions.' Gus later experienced back issues which were mostly resolved, and lived to be 12.5 years old. I must write you and all the other poor babies who wear leg and back braces. It is about our Gus, who is in Dachshund Heaven. Gus came to live with us in 1946, while we were stationed at Gunter Field, Alabama. Gus learned to fly with his daddy and never got airsick. 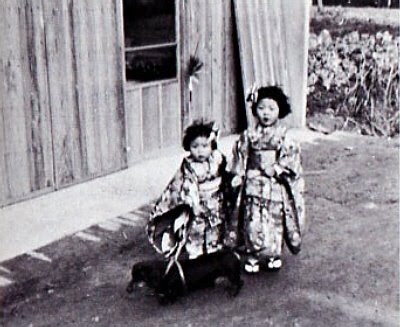 In 1949, Gus and his family flew to Japan, where he was a novelty to the Japanese people. He lived in a big house with seven servants to pamper him. He learned Japanese rapidly. Then came the Korean war. His daddy went, and Gus moved with his mother to Komaki Airstrip. His home was on top of a hill overlooking the flight line. He could lie on the back of a big chair his mother pushed in front of the window and watch the planes land and take off. As his mother was the only American woman on the base, he had many friends and flew with all the pilots, made many missions into Korea and saw his daddy in combat quite often. Stationed there were many types of aircraft, and, because he was an experienced flier himself, he knew what pilot flew each plane. If someone stuck his head in the door and said, "Come on Gus, let's fly," he always beat them down to the line. He knew what plane to go to, and he was rated a senior pilot with combat missions, night and blind flying recorded on his cards and all. Then one day in 1952 his daddy came in and said "Boy, we are going home." His next home was Richmond, Virginia. His daddy was not flying there, and it was a dull life for a while. Because his mother worked also, they would leave him at a kennel during the daytime and pick him up at 5 o'clock. Life in an apartment was no fun. The only thing of interest was the walk he took with his family around the neighborhood before going to bed. One day at the kennel he hurt his back. Life was not worthwhile until the doctor told his family they could take him home every night at 5 and return him at about 10. Always before returning to the hospital, they carried him in their arms around the same old paths he used to stroll. The worst part of the hospital was being catheterized by the doctors. He tried so hard to tell them, but they just wouldn't understand - until one night his daddy held him against his favorite tree, and there it was. 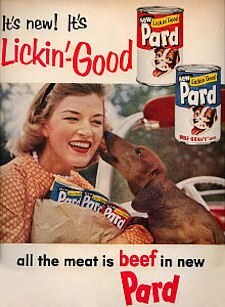 He had been trained to be a good dog. In the apartment kitchen there were dual tubs, one quite deep. His family reasoned that if water therapy benefited paralyzed polio patients, why would it not work on Gus? His daddy fixed the deep tub so warm water ran in and out at the same rate of speed, and they took turns working his legs gently back and forth every night. He seemed to enjoy it, even though the doctors said they might as well put him to sleep - at his age he would never walk again. So every night it was back to the tub. One night his daddy was on the telephone in the next room and Mother was working his legs. As she pulled back on them, he pressed hard against her hand. All she could do was stand there and scream. Daddy came running. That night Gus stayed in the tub a little longer, and everyone had a good cry. About three days later, when they drove up to the hospital, the doctor carried Gus out to the car and put him down on the grass. On weak, wobbly legs, Gus tried to walk on them. Not long after that he did learn to walk again. Once again he was able to go up and down stairs and jump up to his favorite chair. He even flew again. It was a good life until a heart attack while asleep at his home in Florida ended his spectacular life at the age of 12-1/2 years. Editors' note: Mrs. Bond says Gus was paralyzed only about two weeks but that the paralysis was complete while it lasted. "The doctors thought we were out of our cotton pickin' minds," she adds, "but I think the secret is to start the therapy right away." Yes, In a Shop Window's Light He Saw - A White Dachshund! One Sunday in New York I was walking home from the subway when - in the light spilling from a shop window - I saw a little old lady leading - a white Dachshund! The dog was walking slowly, smelling here and there, and she was just keeping him company. It was very nearly pure white, and obviously a Senior Citizen. I knelt, and he waddled over to smell my hand and allow me to pet his boney frame. "He's over 16," the lady said, "and in perfect health. I wish my hearing and sight were as good as his! He's my life. When he goes, I don't want to stay around." She smiled and turned away, leaving me standing there. I never saw them again. Surely they are gone now. Together I hope. Update: Sylar's human writes: i really would like to meet him to the world and made this video. he is carrying all the characteristics of a normal dachshund, being albino doesn't change anything. but there is a problem. people think that albino dogs are evil and they don't even recognize sylar as a dog. i would love to publish sylar in a magazine. if it is possible, can you please help me about breaking this bad superstition? Trust us Nihan. Sylar is 100% dog and dachshund. It doesn't matter what people think or say about him, we know that you love him for the wonderful boy that he is. And Evil? People with such talk are just jealous of his cute pink nose. Sylar is ABSOLUTELY HEAVENLY! It's with a heavy heart that we report the passing of 'Rudy,' the Colorado Springs, Colorado red smooth dachshund whose story we highlighted last November on how to best take care of senior dogs. Rudy recently celebrated his 18th birthday with french fries at Sonic restaurant. 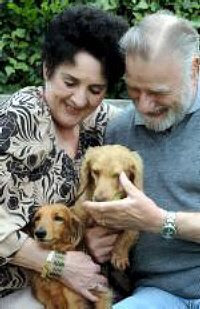 Excerpt from The Gazette: His owners, Sue and Terry Darby, with their veterinarians at Cheyenne Mountain Animal Hospital and Veterinary Specialty Center, had lovingly and realistically worked to give him a comfortable life as he battled kidney problems, diminished eyesight and other geriatric problems. In people years, they estimated he was about 88. "We promised that when the quality of his life was no longer good that we would let him go. And so we have. His heart was still strong, but his little body had deteriorated so much that with the loss of the use of one of his back legs, he just didn't have a lot of fight left in him. Our hearts are broken now, but we know that soon we will enjoy memories of what a wonderful life he had and how much joy he brought to us." Read more at The Gazette. 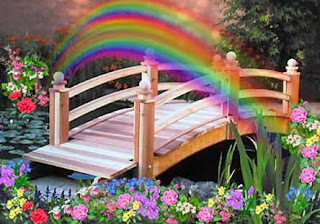 Our hearts go out to Rudy's family and friends. Thanks again to 'Clancy' for the tip about this heart-warming video featuring 'Frankie,' The Walk'n Roll Dog. We featured Frankie's new book back in March, but you can never get enough dachshund inspiration. Frankie, The Walk'n Roll Dog was recently chosen as a finalist for the National Indie Excellence Awards. Woof! Find out more about Frankie at Joyful Paws. "She's always terribly tense before the judging." From a 1964 Victoria, B.C. newspaper. Dachshund HERO Saves the Day! 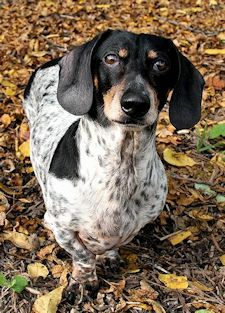 Meet gorgeous black and tan smooth double dapple 'Annie,' who hails from Lake Oswego, Oregon, just outside of Portland. She's a modern-day heroine! The police got a call about a barking dog at 1 AM Tuesday, and when they investigated, they found Annie's human, Pamela Fischer, who has some physical disabilities, had fallen and hit her head in a nearby yard, and couldn't get up. The police called for medical help, and Annie's human is now fine. Read all about it at Oregon Live. Extra treats and a cheeseburger for Annie! Woof WOOF! Did someone say "Lassie?" 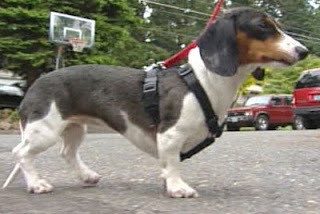 UPDATE May 22, 6 AM: Watch a news video about Annie at Fox12. Meet beautiful Isabella (fawn) and tan smooth 'Zoomer' from Richmond, Virginia. His owners build and ride motorcycle conversions, and since he rides with them, and they wear helmets, he needed one too. 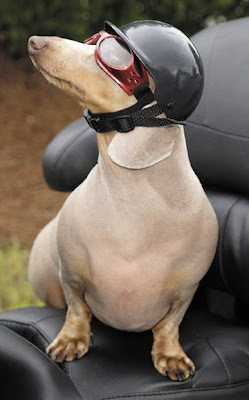 They couldn't find any helmets for dogs, so they created one for Zoomer, and decided to release helmets for pets everywhere, and "The Helmet" by Zoomer GearTM was born! 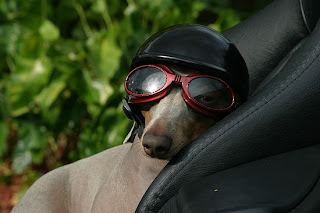 So, if you've already got the doggles and the leather jacket, head on over to Zoomer Gear. Woof! Chocolate and tan smooth 'C.C.' is one of the unfortunate victims of a sign of the times: home foreclosure. C.C. is one of the lucky ones though, as the realtor who found her abandoned in a Kendall, Florida home, fell in love with her and decided to adopt her. Read more about abandoned pets due to home foreclosures in South Florida, and see a nice video with C.C. at NBC6.net. There were a couple of big Wiener Races over the weekend to report! 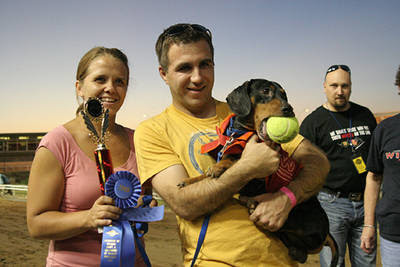 Above, meet the first place winner of the Wienerschnitzel Wiener National Race and Festival at Phoenix Greyhound Park in Phoenix, Arizona. 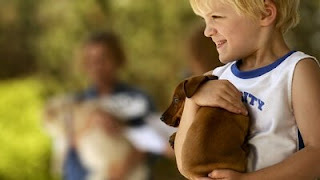 Excerpt from the Phoenix New Times: Wiener dog owners presented their pampered pooches at Phoenix Greyhound Park this weekend for the Wienerschnitzel Wiener National Race and Festival. Interspersed between greyhound races, the little guys got into the race action running 100 feet from the starting box to their owners' waiting arms. Read more and see a fun slideshow at the Phoenix New Times. Keep up with the Wienerschnitzel racing schedule at Wienerschnitzel.com. Over in Oklahoma City, Oklahoma, The Oklahoma Gazette's 4th annual Dachshund Dash benefited the charity Best Friends of Pets. Excerpt from News9: Some competitors showed up with more than just their owner in tow. "Some of the dogs come with a whole entourage. People, team members and practically a support staff of people with outfits and names and cheers and chants for the little wienie dogs," Wertz said. Read more, see more pics, and watch a nice video at News9. NBC's Today Show featured a nice segment yesterday on the highly recommended Eddie's Wheels wheelchairs for disabled pets. Find out more about Eddie's Wheels at the Eddie's Wheels website. 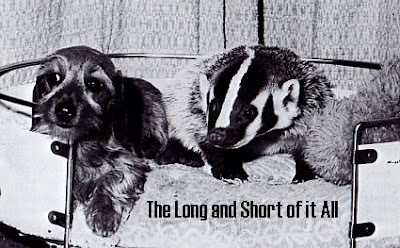 Dachshunds in History: Who Said We Don't Like Badgers? "We don't need no stinkin' badgers!" They're more than welcome to share our doggie bed though. This is a fun tale about some homeless baby badgers who were adopted by a pack of dachshunds! 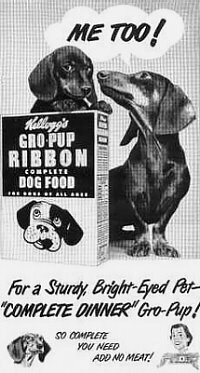 The story was submitted to the August 1965 edition of The American Dachshund by Esther Olson of Santa Maria, California. Woof! "The Badgers Even Accepted the Dogs"
When a young badger invades a miniature Dachshund doggie bed, there could be some resentment. But in this case, there wasn't. We found two baby badgers beside a country road. A tragedy must have occurred in the badger family, for there was no mother, and one of the babies had an injured leg and a bloody stump where a tail had been. The babies eyes were not yet open. We raised them on the bottle. They were friendly, gentle, and definitely nosey. They even accepted the dogs. 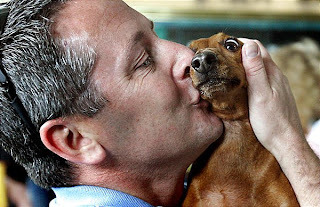 Since the Dachshund is supposed to hunt badgers - well, it's a cute picture, isn't it? The dog pictured is our Rayes Bita Wire Magic. She loved the badger. We didn't want to keep the badgers permanently, so we found them a good home - the San Diego Zoo. These dachshunds know how to stay connected: Canada's Fido Uno wireless phone service. Proving once again that dachshunds are taking over the world, here's a bonus roundup of wiener dog news from all over the continent! 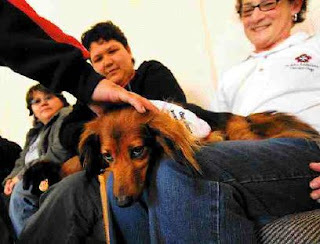 Above, red longhair therapy dox 'Bobbi' comforts Attawapiskat evacuees, who were forced to leave their northern Ontario, Canada homes because of flood threats. Any worries the children might have had about being so far from home seemed to disappear as they hugged, held and walked the dogs at the University of Waterloo, where evacuees are staying. Source. It's Garden Time! Red smooth 'Kisses' rides herd over five other dogs who trail after visitors and shoppers at the Still Meadows Farm, outside of Charleston, West Virginia. The 65-acre working farm also operates greenhouses and has a gift shop. One greenhouse features a stand of homegrown herbs. Source. Smiling at center stage, John Hine, 4, holds up his 7-week-old red smooth dachshund 'Oscar' so the judges can get a good look during the cutest pet contest at the fourth annual Parade Your Pet event, held Saturday in downtown Midland, Michigan. Source. Finally...when is that warm weather coming? 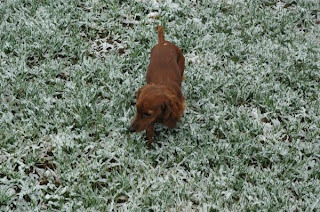 Red longhair 'Duchess' checks out the late-season snow in Lakewood, Colorado this week. Parts of Colarado got up to a foot of snow in a late season storm. Source. Our friends at MidWest Dachshund Rescue have been featured in several local newspapers recently in nice articles highlighting the wonderful work that they do. Last year, the fine reps, along with help from a vast network of supporters and foster homes, coordinated rescue, transport, vet care, fostering, home checks and forever home adoption for 129 dachshunds and dachshund-mixes. Woof! Excerpt from the Post-Tribune: "One of the biggest misconceptions is that all dogs in rescue are abused, which is not the case at all," said Lori Biesboer, MWDR Illinois/Indiana representative. "There are many reasons. Most common is that they are owner-surrendered because the owner does not have time to take care of their dog due to work hours; some are moving and cannot take the dog, or it can be due to a death or illness of the owner." Read more at the Post-Tribune, or visit MWDR and find yourself a new pal. Thanks for all you do MWDR. This is an awesome new educational video about using acupuncture in dachshunds with back issues, or IVDD (Inter-Vertebral Disc Disease). 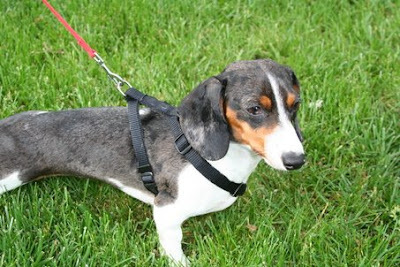 Find out more about dachshunds and IVDD at Dodger's List. 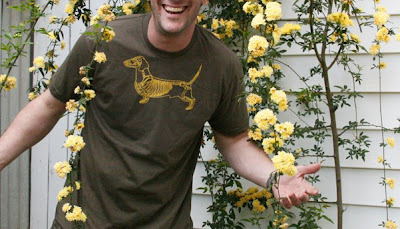 If you want to "worship the fine form of your pooch without feeling like a dork," then a Skeledog dachshund t-shirt might be just what you need. 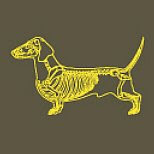 Yellow design on army tee, just 25 bucks at Skeledog.com. Woof! Thomas Patrick John Anson, 5th Earl of Lichfield (25 April 1939 – 11 November 2005) was an English photographer and a first cousin once removed of Queen Elizabeth II. In his professional practice he was known as Patrick Lichfield. His nice work is currently being featured through June 4th in the UK at a show at the Chris Beetles Gallery in London. Find out more at the Chris Beetles Gallery. 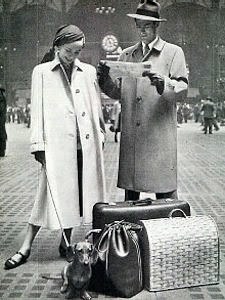 The above photo of Grace Coddington and presumably her red smooth dachshund was taken by Lichfield in Buckinghamshire, March 18th, 1964. Model Grace Coddington won British Vogue’s young model competition at eighteen, and for the next decade lived the life of a cover girl. In 1968, she joined British Vogue as a fashion editor; there she remained until 1987 when Calvin Klein hired her to be his design director. She went to American Vogue the following year and became its creative director in 1995, a position she still holds. Source. Who? You know who! 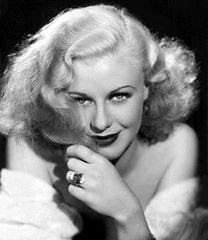 Ginger Rogers (July 16, 1911 – April 25, 1995) was an Academy Award-winning American film and stage actress, dancer and singer. In a film career spanning fifty years, she made a total of 73 films, and is now principally celebrated for her role as Fred Astaire's romantic interest and dancing partner in a series of ten Hollywood musical films that revolutionized the genre. 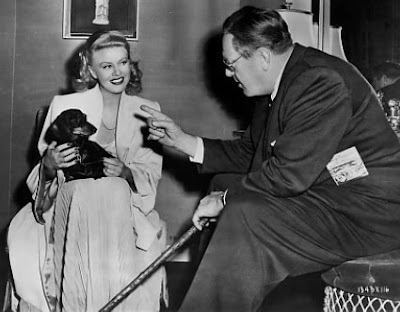 The above photo of Ginger Rogers, director Robert Z. Leonard, and Rogers' smooth black and tan was taken during filming of Week-end at the Waldorf (1945). 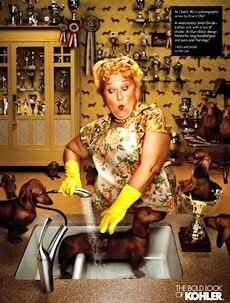 Unfortunately, we don't know the name of her dachshund. 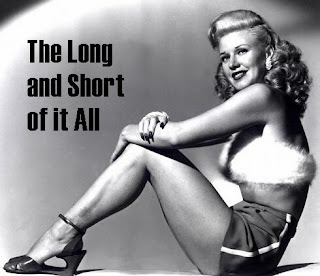 Find out more about Ginger Rogers at wikipedia. 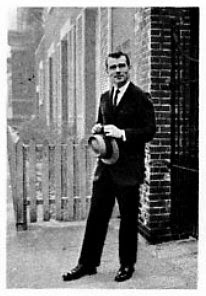 Enjoy one of Fred Astaire's favorite routines with Ginger Rogers, from Barkleys of Broadway (1949), which reunited the dancing duo after ten years apart, and was the last film that they made together. Under forsythias, green and gold. Back and forth o'r the zinnias bold. Black was his coat and tan his feet. Then we'd have laughed, but for our love. Two dogs long and a half dog tall. Three dogs around, so stout was he. "Noodle!" we'd whisper - and there he'd be. And, looking, we saw that he'd met his fate. The blood from his wounds ran down on the floor. We tried to save him, but it was too late. Here we shall lay him, where once he played. No more his small shape will be seen. Under forsythias, gold and green. 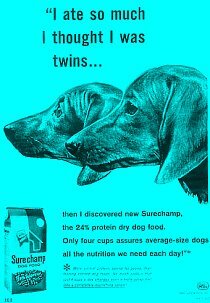 Submitted by Mary Ellis Turner to The American Dachshund, 20th Anniversary Issue, September, 1959. Photo: unknown, 1920s. 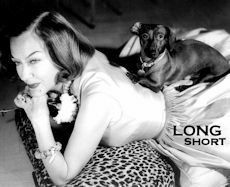 Enjoy another extremely nice film from this year's Dachshund Spring Fiesta in New York! As noted by youtuber govtyule: Dachshund Spring Fiesta 2008 aka Dachshund Festival 2008 aka Dachshund Parade 2008. Music producer Erik Paulsen takes an afternoon vacation with video camera in hand to witness some cool canine com-padres. Even a puppy or two can be found among the dogs. His neighbor leads the way bringing Erik & his wife Joan along with her dachshund "Keira" and her North Star trainee, the Golden Retriever, "Charlie." Washington Square, New York City. Organized by the Dachshund Friendship Club. 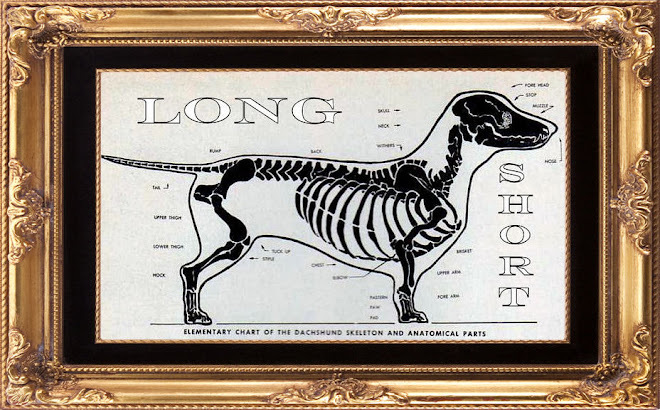 We've said it before: dachshund lovers sure are crafty! We knit, sew, paint, write, photograph, draw, stitch, create....and when we can't buy pink dachshund boxers at the 5 and dime, we make our own! Cut Out + Keeper "K.I." made these stylish boxers for her boyfriend using her favorite fabric. Find out more at Cut Out + Keep. 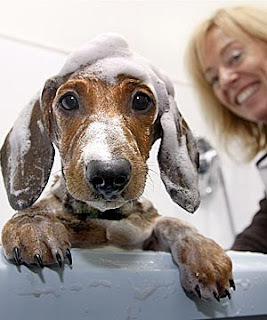 It's spring, and here's an image that is all too common for dachshund lovers this time of year! 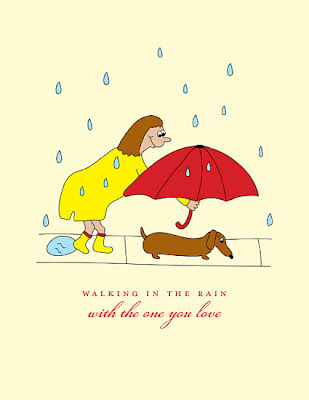 Artist and dachshund lover Stephanie Orma offers up a fun new line of greeting cards called She's SO Creative, which are available on-line at Etsy. There are many doxie-themed cards available, each hand drawn and printed on premium 30% post consumer waste recycled natural stock. Find out more or find a retailer near you at She's SO Creative. We think we know who is really running the palace in Denmark. Just last Thursday, we reported that 'Helike,' the Queen's dachshund, was hit by a car, and there haven't been any updates, but we certainly hope that she is recovering. This week, there are reports that a royal dachshund attacked one of the Queen's guards, resulting in a 3-week sick leave for the 20-year-old guard, who was on standard patrol at the time. Time to call The Dog Whisperer. 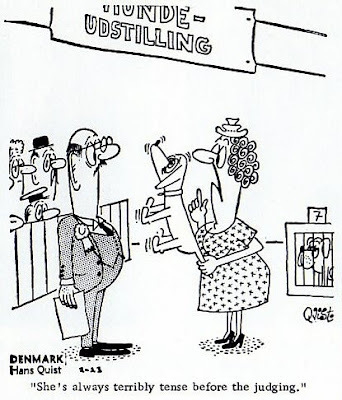 Read all about the drama at The Copenhagen Post. UPDATE: The mp3 source was removed but here it is on video! They just feed me, they just bought me one day. No one owns me, I'm Dixie the tiny dog. I'm thin and I'm proud and no one can make fun of me. But I don't know what I would do wrong. My body yields no evil inclinations. I'm a pure weiner dog. And there's nothing for me. And then feed me this succulent dish, and I will eat. To have a drink of cool water in that well. Because I'm Dixie the dog and I like water. And the back of me goes in front of me . . . slowly. I'm long and I'm thin. I'm Dixie the tiny dog and I like it. Meet red longhairs 'Shadey' and 'Cassie,' who hail from Barham, UK. Their humans, David and Maureen Westgate, are gushing with joy to have the duo back after they were stolen from their backyard 3 months ago. Shady was found and returned to them several weeks ago, and 11-year-old Cassie was just found as well. Excerpt from The Evening Star: On Tuesday night the pair broke down in tears when police officers knocked on their door with 11-year-old Cassie. 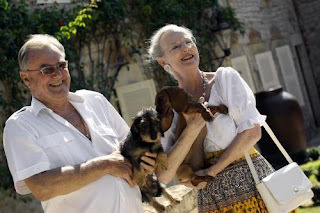 It came just weeks after the couple were reunited with Shadey, who was found straying in the country. Mr. Westgate said: “This is just unbelievable. Shadey's return last month was amazing but there was always a dark cloud over it because we knew Cassie was still out there." Read all about the happy reunion at The Evening Star. 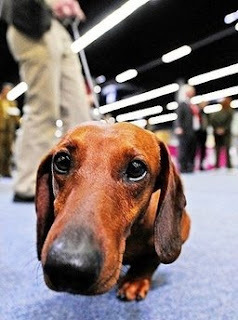 Dachshund News from all around the globe! Woof Woof! Who's a stinky dog? Not red smooth 'Lucy,' from Wellington, New Zealand. Lucy gets an environmentally friendly herbal shampoo containing olive, palm and coconut oils at her local groomers. There's a big move towards chemical-free and green products for our pets, and The Dominion Post takes a look at the trend, including biodegradable doggie poo bags, and even vegan options in the article A-rover-therapy. News from the motherland! A red smooth dachshund takes part in the German Kennel Club Dog Show 2008 in the western German city of Dortmund over the weekend. According to organizers, the show features more than 6,000 dogs and is one of the biggest dog shows in Europe. Source. Finally, dappled 'Hildy,' and red smooth 'Aubrey,' who hail from Salt Lake City, Utah, were blessed on Saturday, at a non-denominational event at the local Christ United Methodist Church. Read all about the event, and our spiritual relationship with our furry friends at The Deseret News.